If you have a hot date and don’t want to show up in your 93′ Honda Civic pimped out with a hood scoop and mismatched body kit, Getaround.com is your answer. Getaround.com is a innovative peer-to-peer social car sharing service. Rather than renting a car from Enterprise or Avis, you can instead rent a car directly from someone locally. Rent cars from real people in your neighborhood. Daily and hourly car rental rates are available to fit any occasion or need. Each rental includes insurance (liability, collision, property damage, and uninsured motorist protection). You can also complete your rental via the Getaround.com iPhone car rental app. Those without iPhones can use the standard Getaround.com website to complete their car rental. According to Getaround.com, car owners only utilize their cars 8% of the time. Considering cars depreciates in value over time, it makes a lot of sense to rent out your car and make few extra bucks on the side. To ensure your car is treated well, Getaround.com screens their drivers to ensure they fit specific eligibility criteria. 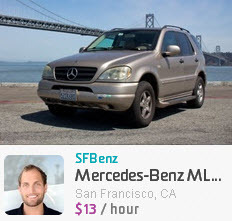 Getaround.com’s rating system is also a great way to qualify both the renter and the rentee. If you have used a social car sharing service, please leave a comment below and share your experience. Do Year End Performance Appraisal Reviews Matter?